^ a b c d Weber, Nicholas (1913). "Albigenses" . In Herbermann, Charles. Catholic Encyclopedia. New York: Robert Appleton. ^ Vacandard, Elphège (1913). "Arnold of Brescia" . In Herbermann, Charles. Catholic Encyclopedia. New York: Robert Appleton. ^ Ott, Michael (1913). "Pope Innocent III" . In Herbermann, Charles. Catholic Encyclopedia. New York: Robert Appleton. ^ Murphy, Cullen (2012). "Torturer's Apprentice". The Atlantic. Retrieved September 26, 2017. ^ "Lemkin, Raphael". UN Refugee Agency. Retrieved July 30, 2017. Le Roy Ladurie, Emmanuel (1978) . Bray, Barbara, ed. Montaillou: Cathars and Catholics in a French village: 1294–1324. London, UK: Scolar Press. ISBN 0859674037. Lemkin, Raphael (2012). Jacobs, Steven Leonard, ed. Lemkin on Genocide. Lanham, Maryland: Rowman & Littlefield. ISBN 978-0-7391-4526-5. Marvin, Laurence W. (2009b). "A Most Holy War: The Albigensian Crusade and the Battle for Christendom (review)". The Catholic Historical Review. 95 (4). doi:10.1353/cat.0.0546. Retrieved May 4, 2016. Mosheim, Johann Lorenz (1867). Murdock, James, ed. Mosheim's Institutes of Ecclesiastical History, Ancient and Modern. London, UK: William Tegg. Power, Daniel (October 1, 2009). "Who Went on the Albigensian Crusade?". The English Historical Review. 128 (534). doi:10.1093/ehr/cet252. Retrieved September 8, 2017. Peter of les Vaux de Cernay (1998) [1212–1218]. Sibly, W.A. ; Sibly, M.D., eds. The History of the Albigensian Crusade: Peter of les Vaux-de-Cernay's Historia Albigensis. Suffolk, UK: Boydell & Brewer. ISBN 0-85115-807-2. Gui, Bernard (2006). Shirley, Janet, ed. 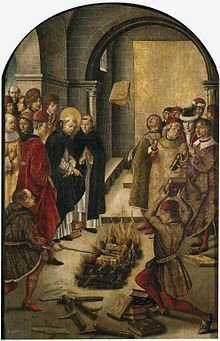 The Inquisitor's Guide: A Medieval Manual on Heretics. Welwyn Garden City, UK. : Raventhall Books. ISBN 1905043090. Guillaume de Puylaurens (2003). Sibly, W.A. ; Sibly, M.D., eds. The Chronicle of William of Puylaurens: The Albigensian Crusade and its Aftermath. Suffolk, UK: Boydell & Brewer. ISBN 0-85115-925-7. Milo; Arnaud Amalric (2003). Sibly, W.A. ; Sibly, M.D., eds. Report of the legates Milo and Arnaud Amalric to Pope Innocent III on the first few weeks of the Crusade. Suffolk, UK: Boydell & Brewer. ISBN 0-85115-925-7.